Comprised of a seven mile long stretch of white sandy shoreline, Fort Myers Beach, Florida, is a beautiful place to call home. Once a remote location that was only accessible by boat, Fort Myers Beach was transformed when a bridge was constructed to connect the mainland to the gorgeous Estero Island. Since that time, people from all over the globe have been flocking to Fort Myers Beach. One of the world’s safest family beaches, Fort Myers Beach is known for not having an undertow and for having shallow waters. Those two factors make it an ideal destination for family recreation and leisure. In addition to these great features and the undeniable natural beauty of the area, Fort Myers Beach boasts many other exciting recreation opportunities including sailing, kayaking, boating, fishing and wildlife watching. 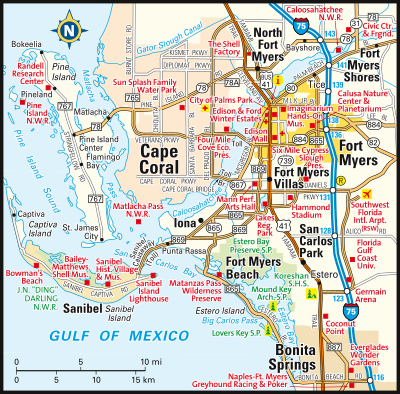 Not only is Fort Myers Beach, Florida, a vacation paradise, it is also a great place to live. Boasting a charming Old Florida ambiance and spectacular dining and shopping opportunities at Times Square, Fort Myers Beach has everything needed for daily life. The community also has abundant opportunities for entertainment at its various festivals and events throughout the year. Buy a home in Fort Myers Beach and live a life of luxury all year round. With near-perfect weather all year, it is easy to understand why Fort Myers Beach is a must-consider destination for prospective homebuyers relocating in the Cape Coral-Fort Myers metro area. Whether you are looking for the perfect investment property, vacation home or primary residence, Fort Myers Beach has it. Homes for sale in Fort Myers Beach come in a wide array of architectural styles, ages, sizes, and therefore prices. You can easily find cottages, condos, townhomes and single family homes for sale throughout the Fort Myers Beach community. While there are sometimes exceptions, typically you can find a 1,000 square foot, two bedroom, two bathroom condo in Fort Myers Beach for around $220,000 to $335,000. Townhomes for sale in Fort Myers Beach will have listing prices in the $500,000 to $4 million range, while single family homes will usually cost several million dollars. If you would like more information regarding homes for sale in Fort Myers Beach, Florida, please do not hesitate to contact us today for assistance.